Richard T. Herman is the founder of Richard T. Herman & Associates, an immigration and business law firm in Cleveland, Ohio, which serves a global clientele in over ten languages. He is the co-founder of a chapter of TiE, a global network of entrepreneurs started in 1992 in Silicon Valley. He has appeared on ABC's 20/20, National Public Radio, Fox News, and various affiliates of NBC, CBS, and ABC. He has also been quoted in such publications as USA Today, InformationWeek, PC World, Computerworld, CIO, Site Selection, and National Lawyers Weekly. Robert L. Smith is a veteran journalist who covers international cultures and immigration for The Plain Dealer, Ohio's largest newspaper. 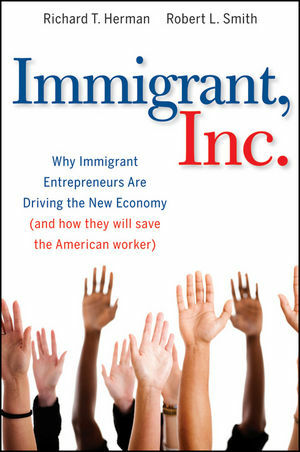 He has written extensively about immigration issues and has interviewed people at all points of the immigrant experience, from undocumented field workers to millionaire entrepreneurs. Introduction: Welcome to Immigrant, Inc.
Chapter 1 A Mighty New Idea. Chapter 2 The Mounting Evidence. Chapter 3 A Land of Opportunity, Still. Mexico Never Tasted So Good. No Room for a Dream. Chapter 5 Earth's Best and Brightest. Out of Shadows, into Solar. Love, Study, and a Start-Up. Chapter 6 Cowboys of a New Frontier. A New Kind of Entrepreneur. Joining a New England Tradition . Chapter 7 Desperate Achievers: Prequel to Google. A Wave of Home Restorers. Chapter 9 The Stimulus We Need. The Change We Need—Changing Attitudes. Chapter 10 Thinking Like an Immigrant. A Nation of Immigrants Indeed.